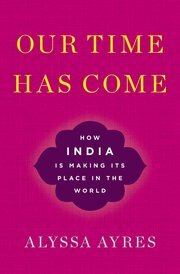 Author Alyssa Ayres discusses her new book about India's evolving political and economic landscape. Knowledge@Wharton: India is, from all accounts, going to see incredible growth in the years to come. Alyssa Ayres: Yes. It has seen incredible growth also over the past 25 to 28 years. There’s certainly a lot of potential – more upside – to go. People in the business community see in India so much opportunity in the momentum and the dynamism. India has a lot of domestic challenges, so oftentimes, when you have conversations about India outside of the business space, people aren’t always able to look past its many challenges and domestic vulnerabilities. So it is always a different kind of a dialogue to talk with people who are focused on the real, tremendous potential that India still has ahead of it. Knowledge@Wharton: The title of your book, Our Time Has Come, I believe is a quote from two prime ministers – Narendra Modi, the current prime minister, and the previous prime minister, Manmohan Singh. Knowledge@Wharton: Do you agree with their view that India has now arrived on the world stage? And if so, why? Ayres: In many ways, India has arrived on the world stage. [It] certainly [has] in terms of economic growth and the transformation that is in process. I’m not saying [that transformation] is complete, [or that] India has solved all of its domestic problems. But according to the International Monetary Fund’s World Economic Outlook report of April 2018, India is now the world’s sixth-largest economy, moving up from seventh largest. It has overtaken the size of the economy of France. Some estimates suggest that India could overtake the U.K. economy by the end of this calendar year. That would make India the world’s fifth-largest economy. So we have to start thinking of India both as one of the world’s major economies, even though it does have a lot of domestic economic challenges at home. In that sense, I do think that India has arrived on the world stage. India continues to face a lot of challenges when it comes to gaining access to the kinds of global institutions through which the world carries out diplomacy, works on security challenges, and engages in economic consultation. I devote some component of my book to this challenge of global governance and India’s desire to have more access to those conversations. Knowledge@Wharton: How much of a role do you think India wants to have in those conversations? We could also look at economic institutions, like APEC – the Asia-Pacific Economic Cooperation forum. This is a grouping that talks about ways to improve and promote free trade and investment. Well, India is Asia’s third largest economy. It’s not a member. It’s had a membership request going back more than 20 years. There have been no new members inducted since a moratorium on membership for APEC ended in 2010. This is a real problem for the legitimacy of APEC to have India on the outside. By the way, this is the example I often give: This year’s APEC summit host nation is Papua New Guinea. It’s wonderful that it is a member and that it is upholding the principles of free trade and investment. But this is a country with a GDP of about $20 billion. And India’s GDP is growing — from $2.6 trillion dollars now, and is on track to become a $3 trillion economy fairly soon. It really raises questions about access to those kinds of decision-making, consultative fora in which India could and should be playing a leadership role – and one that it does seek. Knowledge@Wharton: What do you think is holding back the access? What are the barriers, and how can they be overcome? Ayres: Some of these are just institutional inertia problems. Certainly a U.N. Security Council reform will be very difficult. I can’t sugar-coat that; any reform process will take years. It’s very difficult to create a slate of candidates for expansion, and then there are issues in terms of whether the Security Council permanent members should have a veto power or not. All these questions remained unresolved. Nobody can agree on those. I should note that it is declared U.S. policy to support Indian membership in a reformed and expanded U.N. Security Council. President Obama made that declaration in a statement before the Indian Parliament, when he visited in 2010. So this is not something the U.S. has completely ignored, but I just don’t think that we have put our shoulder to the wheel on the question of helping push ahead reform. Knowledge@Wharton: Looking back to what you said a little bit earlier about economic potential, there’s also a general election coming up in India next year. Do you see any potential risks on the economic front that could sidetrack the path that India is on? Do you see, for example, economic populism or religious fundamentalism derailing the process of economic reform that has allowed India to become financially so successful? Ayres: This is always a risk with any major election, because Indian elections are not won on declarations of economic reform, right? That is not the platform that wins you votes. The platform that wins votes in India is a platform that often offers free electricity and water and irrigation. That’s the challenge. Over the past year-and-a-half or so, throughout successive state-level elections in India, there’s always an election going on. In fact, there was just an election recently in a very large state – Karnataka. We have seen a series of welfare announcements, or the forgiveness of loans to farmers who, undeniably, are suffering. These are big, complex domestic economic policy issues, to try to figure out how to provide support in times of monsoon variability and challenges with crop yields and such that are really important for people who do vote in large numbers. But in the run-up to the [2019 general elections], we’re not likely to see, for example, major economic reforms, the type of which can help unleash greater Indian economic growth in the coming years and decades. Knowledge@Wharton: Do you think that the government of Narendra Modi and his party, the BJP (Bhartiya Janata Party) will be vulnerable to a challenge from Rahul Gandhi and the Congress Party, or perhaps a coalition of parties? Ayres: It is hard to know what could emerge. The Karnataka election results illustrate that the BJP in that state was not able to secure a single-party majority…. The complexity of India’s political scenario with so many different parties [is significant, especially with] the ability to have both pre-poll as well as post-poll [alliances] or support from the outside to form coalitions. I would be a fool to make a definitive prediction about what might happen. Knowledge@Wharton: Regardless of whether or not we make a prediction, what will happen to India making its place in the world – if the BJP or the Congress Party were to win, or if India were to go back to coalition politics? Ayres: Let me answer that with two related but parallel replies. The first aspect of that is ambition and direction – the trajectory of foreign policy. I found it very interesting that when the Congress party held its plenary meeting in March, it released a statement on foreign policy that largely affirmed and agreed with the direction that the Modi government has taken on foreign policy. It affirmed the notion of India now calling itself “a leading power.” This is a new innovation of the Modi government, but it positions India in the direction that the country’s previous leaders from different parties have sought to see India placed on the world stage. The idea that the Congress plenary would affirm India’s foreign policy direction under the present government suggests that there is a lot of consensus within India across parties that India does deserve that place on the world stage. The thing that I do worry about is the economic front. It is so difficult to continue political reform and economic reform in India. It was very difficult for the Modi government to get the Goods and Services Tax through. This was a constitutional amendment – something that the previous Congress-led UPA coalition government had attempted – but wasn’t able to get through. The Modi government tried to get through labor law reforms, and tried three times to issue ordinances on land acquisition reforms. All these would be helpful to unleash the manufacturing sector. It’s difficult to get these things done with a coalition government, where you’ve got disparate parties, not all of which agree on the direction towards a more market-based economy. That poses some significant challenges. Knowledge@Wharton: If you look at the recent past of India and the growth that it has had, are there other countries that are going through similar types of issues now, in terms of their growth? Ayres: In so many ways, India is unique on the world stage, in terms of size, complexity, and the challenges it has faced. India’s economic trajectory, in terms of reforms and the onset of reforms is about 15 years behind China’s. That doesn’t necessarily mean that India will follow the same precise path, but it does suggest that the pathway that India began in 1991 still has tremendous potential ahead of it. I am a specialist of this region, and I don’t do global comparative work. But I just can’t think of a country with similar scale, similar complexity, and similar political complexity that India has. Knowledge@Wharton: Yes, and obviously when you’re talking about the political side of it, the difference between China and India is fairly significant. Knowledge@Wharton: So you would be hopeful that India would take a much different path in terms of mindset and freedom and other issues than going down the path of China. Ayres: Well, this is the issue. The political challenges to economic reform are really substantial in India because people have a voice. They can debate. They can throw leaders out of office if they don’t like the direction that they’ve been going. You have civil society, which can hold protests and say, “We object to this. You’ve got to take us into consideration.” You’ve got mechanisms through the judicial system, where people can file public interest litigation about problems like, say, a large dam that may displace people. None of those complexities [affects] China. [It] can make big changes right away – it moves quickly, no problems. But this is a challenge and a vulnerability for India, because it also makes it much harder to carry out large-scale infrastructure development, for example. As I say in the book, these complexities are real, but that aside, I’ve never met anybody in India who would trade democracy for a faster-moving system. Knowledge@Wharton: Since we were speaking of China, I wonder if we could talk about one Chinese initiative about which a lot has been written – the One Belt, One Road initiative. What has been India’s strategic response, and what should that be? Ayres: India has had a very specific strategic response to this. It has been very vocal, and is the one country on the world stage that has not endorsed the One Belt, One Road initiative. India declined to send an official to the Belt and Road Forum last May, and India’s ministry of external affairs has created a list of the problems and concerns it has with the initiative. Foremost among them are issues such as the lack of transparency, in terms of the way Belt and Road loans are negotiated … and the financing [of the projects]. This can create problems of a debt trap or what has in other contexts been called “predatory economics,” [affecting] the viability and sustainability of some of these projects. At the same time, India partners with China in other contexts. India is the number two capital contributor to the Asian Infrastructure Investment Bank. India partners with China in the BRICS Organization – the multilateral institution formed by Brazil, Russia, India, China and South Africa. They [also] created their own development bank. So you do see India partnering with China in groupings of other countries that are carrying out infrastructure investment loans on a transparent basis. Knowledge@Wharton: The last section of your book deals with how the U.S. should deal with a rising India. Is the strategy of the Trump administration towards India the same as that of the Obama administration and previous administrations, or do you see a difference? And if there is a difference, is it one of style or of substance? Ayres: There is a difference on the economic side. I think on the strategic and defense side, they are continuing on the trajectory that was begun under the George W. Bush administration and carried forward by the Obama administration. You do see the Trump administration continuing to partner deeply with India, and looking to grow the strategic consultation and cooperation. That is a very positive story. I do hope that it will continue to see the rise of the concept of the Indo-Pacific region as a space where India and the U.S. can continue working more closely together to uphold a free and open Indo-Pacific, and partnering closely with Japan and Australia. Defense is in many ways one of the leading edges of the U.S.-India relationship now. I do see a difference in the way the Trump administration is approaching India on the economic side. [The U.S. has] a long list of frictions with India on the trade front. Certainly U.S. government officials consistently seek greater market access, a level playing field and access to the Indian market for American companies. That’s very high on any U.S. government official’s list. Now the Trump administration has taken up some economic approaches that are quite different than previous administrations, such as a focus on bilateral trade deficits. This was really never on anybody’s laundry list of discussion points. India makes that list. There’s about a $26-billion trade deficit with India. So that’s now added to the frictions list. It turns out other things create additional frictions. The Trump administration has imposed steel and aluminum tariffs. This is not directed at India, but India is caught up in this, like some other countries, as well. The issues on immigration, again, do not specifically target India, but broadly, this also is an issue on the frictions list. Knowledge@Wharton: The issue of H-1B visas for skilled workers has been in the news quite a bit. So looking at the economic relationship between the U.S. and India, do you foresee any potential landmines that could blow up the relationship and undermine the positive relationship that exists? Ayres: I try to be optimistic, and I try to look for areas where success is likely to occur. For example, defense trade has been a great story. Procurements from U.S. companies have gone from essentially zero to more than $15 billion over the last 15 years. That’s a big deal. That’s a big change. I hope that does continue. You see intensified interest in India in its own defense modernization and intensified interest from the United States in supporting that process. So India can be and can continue to grow its capacity as a net provider of regional security, across the Indian Ocean region. But are there huge landmines? There are not so much huge landmines poised to blow up, but rather maybe a series of small gates and hedges that will be a problem, and people are going to find themselves stepping into brambles that may not go away easily. India’s not the easiest place to do business. This will continue, and is not specifically directed at American companies, but India is No. 100 on the World Bank’s Ease of Doing Business index. The optimistic view is that it has moved up 43 places in the past three years – that’s great. [However,] it’s not in the top 50; there is some distance to travel before it’s an easier place to do business. You always hear from companies about problems they face. For example, somebody needed a permission, and it has taken 10 months. I think that those types of issues will continue.